Has the Wall Street bull fallen over? 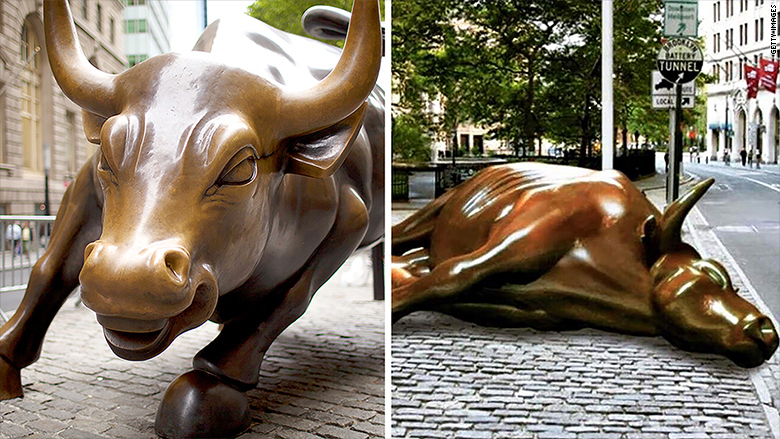 In the midst of the massive stock market selloff, an image has been circulating the Internet of Wall Street's iconic bull lying on its side. It is good comic relief, but let's get something straight: America's stock market is pretty far from the "dead bull" level. Stocks would need to plunge 20% from their peak levels and stay down that much for awhile in order to be considered a true bear market. We aren't there yet. We aren't even close. Even after all this selling, the S&P 500 is currently down 12.5% from its all-time high. That's barely enough to qualify for a 10% correction. Of course, smart investors always look ahead. Could it get worse? Where will stocks end the year? It's easy to be pessimistic when there's a sea of red on the trading screen, but there's a strong case to be made that stocks will still go up from here. Many Wall Street experts predict the S&P 500 will end the year around 2,100. That's a lot higher than where the market is now and would mean stocks would close out 2015 with a small gain. 1. The U.S. economy isn't on the verge of a recession. Bear markets typically occur when the economy is in or close to a recession, according to Capital Economics. At the moment, the U.S. economy looks healthy. It's on track to grow about 2% this year, and unemployment is back at the low levels it was at prior to the Great Recession. That doesn't mean there aren't problems, but America is pretty far from a recession. "The evidence still suggests the global economy is not on the cusp of another recession," wrote BlackRock's global chief investment strategist Russ Koesterich in a note to clients. 2. China's effect on U.S. is limited. The pessimists on Wall Street point to China's economic slowdown and how that could spillover around the world. China has been at the center of this global selloff, but the U.S. isn't as exposed as people think. The reality is that only 2% of the revenues from the entire S&P 500 come from China, according to Goldman Sachs. That's pretty small. As Apple CEO Tim Cook wrote in an email to CNBC's Jim Cramer Monday, "I can tell you that we have continued to experience strong growth for our business in China through July and August." Related: China's economy is in trouble. Just how bad is it? 3. American businesses are doing pretty well (outside of energy). At first glance, corporate earnings are ugly this year. Howard Silverblatt, the senior analyst at S&P Dow Jones, notes that 2015 year-on-year earnings could decline for the first time since 2008. But dig a little deeper and it's actually not that dire. The one bad egg there is energy. The dramatic fall in oil prices from over $100 a barrel last summer to under $40 now has slashed profits at big energy companies. Earnings for those are down by about half, if not more. "Energy is taking the wind out of earnings," says Silverblatt. But sectors like health care and technology are still projecting a lot of growth in 2015. 4. The Federal Reserve sounds cautious. One speedy way to tank stocks and the economy is for the Fed to make a mistake -- usually, raising interest rates too early, which can curtail economic growth. It's certainly possible that could happen again, but current Fed chairwoman Janet Yellen and her colleagues have been very outspoken that they are watching the economic and financial numbers closely. They do not intend to raise interest rates unless the economy is strong enough. The current Fed leadership is in touch with Main Street and Wall Street. There is now a big debate about whether the Fed will make its first interest rate increase in nearly a decade in September or whether it will wait until December -- or even 2016. There's a lot of uncertainty, but the point is no one thinks the Fed is going to hike rates a lot and cause a recession. Related: Is the Fed trapped? 5. Stock prices aren't crazy high anymore. Pessimists argue that stocks are still too expensive, even after the latest pullback. New York Times columnist David Leonhardt wrote about it again this week. The S&P 500 is trading at just over 16 times forward earnings, according to Goldman Sachs. That's down from above 18 before this recent selloff. The average for the past decade is about 14. So it's still a little high, but not nearly where it was. 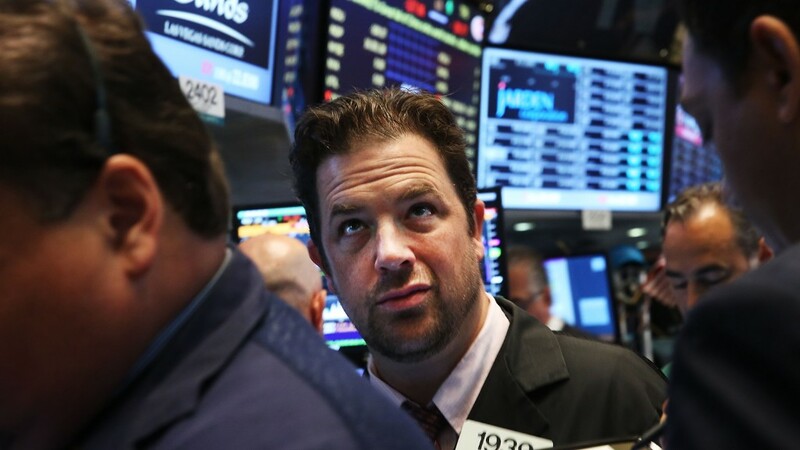 Putting all of these factors together, there isn't an obvious trigger for a major stock market downturn that would kill the six-year bull market in the U.S.
As Mohammad El-Erian, the chief economist at Allianz, told CNN this week, "Longer term, this correction will be a good thing. Do not panic at this point."